instead of Tuesday for me! ooooh, all the wonderful feet whiffies! Sam, shoes ROCK! Our mom's feet must be particularly offensive, because we steer clear of her shoes...and her feet. Haha. Ah you look so comfy. Now I wanna try that! That looks like a really good snoozing spot. We would probably need nose plugs if that was our Daddy's shoe! I think Shoesday is a wonderful day. I wonder if Truffle will love shoes . . . Happy Shoesday to you too, Sam!! 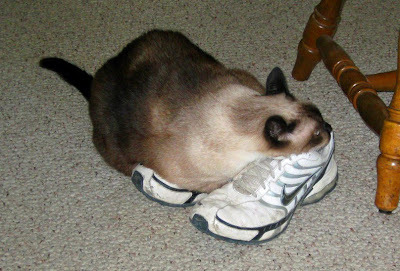 Sam, we would never consider our human staff's shoes, but you look mighty comfortable in yours.